I guess I should call this one Aurora , but I heard the song Stardust and just felt like it was more poetic. So here it is, “Stardust”. Once you see an Aurora Borealis, you will never forget it. I can tell you the years that I have seen them–1967, 1974, 1987–and if you listen, you can hear them, too ! It’s a swishing and crackling sound. This is the view of the valley looking from Moss Hill in Horseheads looking over the airport on the right and toward Route 86 right up the middle. But I had to insert the aurora, cuz I haven’t seen one from this view yet, but I’m waiting for it to happen. That’s the nice thing about being an artist, with just a few brush strokes, you can make all kinds of things happen. I just got tired of waiting, so I made it happen. I’m sure when I do see it for real, it will blow me out of the water and I’ll paint it then. For now, this pleases me, but mother nature has a way of making artists look pretty feeble. At the very end, I decided I needed a sliver of a moon, so there it is. I’m not sure why I needed it there, it just felt right, along with a few stars floating around to try to give some dimension to the sky. Night time painting offers a whole new set of problems. If you try it from memory, well, good luck ! Photos don’t catch it either. 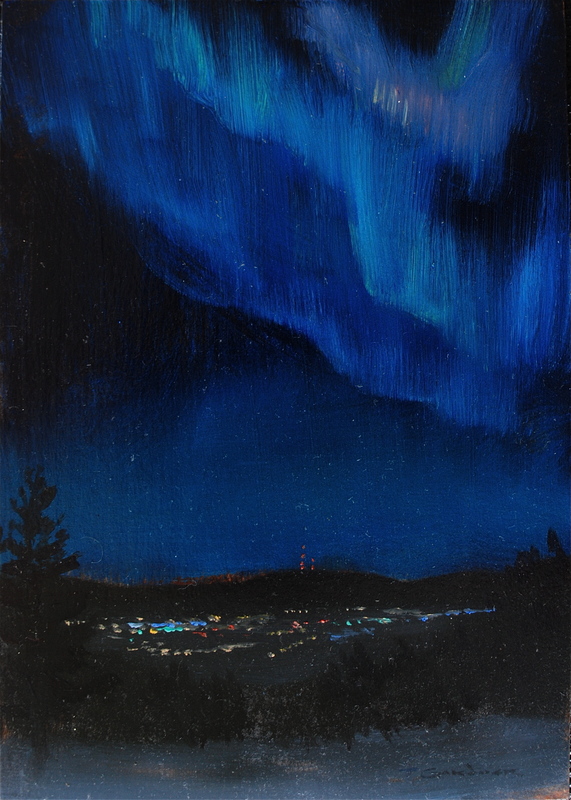 I’ve stood out on freezing nights, overlooking the valley, with a flashlight in one hand and a brush in the other, stabbing at frozen paint on the pallete. 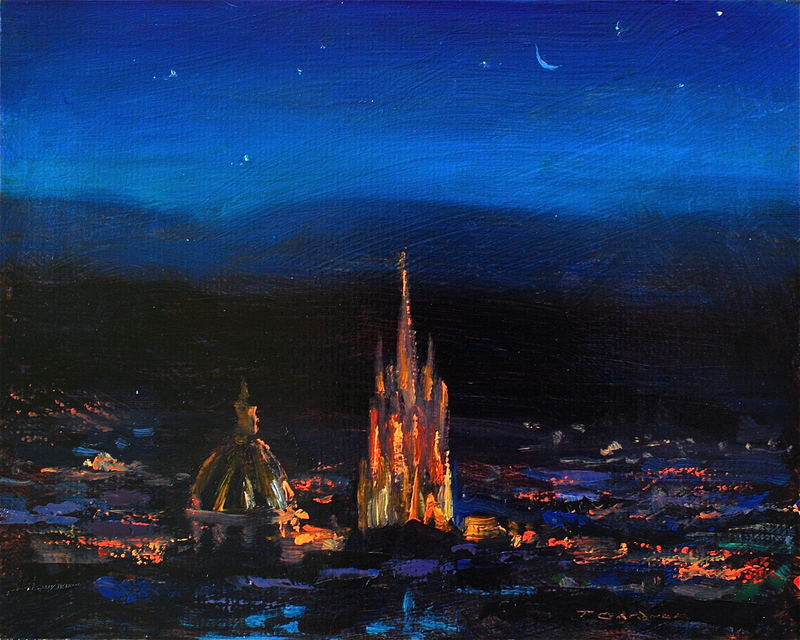 But then, I did see a night time painting of San Miguel de Allende, Mexico at an exhibit down there, so I rifled off a quick sketch from memory. When I finally was able to get back to the exhibit to see that painting again, I liked my version , I just haven’t translated it to a bigger one yet.